World Superbike champion Jonathan Rea has been confirmed as the star guest for the Cornmarket Motorbike Awards in January. World Superbike champion Jonathan Rea has confirmed his appearance at the Cornmarket Motorcycle Awards in January. Rea will fly into Belfast during a break from pre-season testing in Spain to attend the gala event at the Crowne Plaza Hotel in Belfast, where he will be the overwhelming favourite to win the coveted Joey Dunlop trophy for the third consecutive year. The 30-year-old retained his title with a stunning victory in the wet at Magny-Cours in France, becoming the first rider ever in the history of the championship to secure the world crown in three successive seasons. Rea has drawn level with Australian rider Troy Bayliss on the all-time roll of honour with three championships to his credit. Only Blackburn’s Carl Fogarty, regarded as the greatest World Superbike exponent ever, has won more titles, clinching the championship a record four times. Rea will attend the star-studded bash in the New Year on Friday, January 26, when he is assured of a hero’s welcome. The Ballyclare man is a shoe-in to be crowned the Irish Motorcyclist of the Year once again on the back of another incredible chapter in his career. Only road racing legend Joey Dunlop has won the accolade three years in a row, with the five-time Formula One World Champion bestowed with the honour between 1983 and 1985. The awards organisers have teamed up with the Enkalon Motorcycle Club to present the top award, with Rea’s opposition including British Motocross MX1 champion Graeme Irwin and his brother Glenn, who won the feature Superbike race at the North West 200 in May before sealing his maiden British Superbike success at Silverstone. 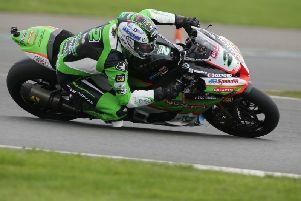 British Supersport frontrunner Andrew Irwin is also in the running along with champion-elect Keith Farmer, who is set to become a British champion for the third time this weekend at Brands Hatch. Adrian Coates, chairman of the awards judging panel, said: “Jonathan is one of the hottest properties in the sport at the moment and for him to fly home during testing for the new season shows just how committed he is to celebrating his success at home with his many fans. In all more than a dozen awards will be presented on the night. The black tie event will welcome some of the biggest names in the sport and details of how to vote will be announced soon. All details are also on Twitter using the handle @BikeAwards and the dedicated Facebook page Cornmarket Motorbike Awards.